Are you familiar with the SplashMath series? If not this is one series that has been consistent throughout all of their apps. They have also been the forerunner in aligning the apps to the Common Core Standards. SplashMath Kindergarten by Study Pad, Inc.
is $9.99. and covers 7 chapters of math that is appropriate for children who are on grade level and for those who need the extra help to understand counting to 20, number representation, addition concepts, subtraction, geometry and measurement. Most important is the presentation of the app. First, there is a parents button that you hold for 2 seconds. Set a goal whether it is increase concentration or set a number of questions to get correct. Next, add a topic from the built in syllabus. In the settings you can control music in the background, emailing weekly reports, sync data in the cloud and even the sync the timezone. Under the player’s settings you put the child’s name and the number of attempts the child has made. At the end of a chapter or a quarter you can send a graph of the student’s work. 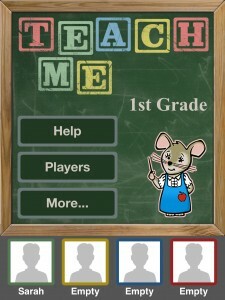 The app uses a child’s voice to give directions helping those children who need the an audio component. The jungle theme is enticing as children of this age love looking at bugs and different animals. The “mistro” of the app is a hippo who tells the child when they are correct or to try again. This is clearly one of the most sophisticated and detailed data tracking apps for both parents and teachers. This is a great app for Response to Intervention helping parents see where students are struggling early in the child’s schooling. The student will rote learn subtraction facts up to :number.